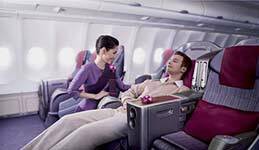 Book Thai Airways flights & plane tickets on NusaTrip.com. Search any flight routes, compare prices with other airlines : Simple & Fast, 24/7 instant booking. Thai Airways is the national flag carrier of Thailand. From its hub at Suvarnabhumi Airport, Thai Airways flies to 75 destinations in 35 countries, using a fleet of more than 80 aircraft. THAI's route network is dominated by flights to Europe, East Asia, and South/Southwest Asia, though the airline serves Johannesburg in South Africa and five cities in Oceania. THAI was the first Asia-Pacific airline to serve London Heathrow Airport. Among Asia-Pacific carriers, THAI has one of the largest passenger operations in Europe. Royal First Class : On board, in the privacy of their segregated cabin, passengers receive exceptional, friendly, and personal hospitality from a dedicated cabin crew member. Luxury innovations include the newly installed sleeper seating. Electronically controlled, with 180 degrees of recline and almost seven feet of space in which to stretch out. On intercontinental flights lasting six hours or more, comfort wear and slippers are provided. On flights four hours or more, a beautiful tailored travel kit is offered. 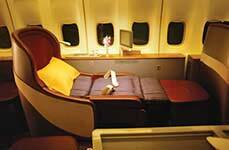 Royal Silk Class : On board THAI flights Royal Silk class passenger enjoy segregated cabins, with two-abreast seating. On long-haul flights, newly installed shell seats offer 60 inches (five feet) of stretch-out space, with 170 degrees of recline for sleeping. Each electronically controlled seat is equipped with telephone and laptop power outlet. THAI Royal Silk Class passengers also receive the most generous hospitality during their flights. For resting times, soft blankets and pillows will comfort them, while their lavish multi-course meals are served, gourmet restaurant style, with a tempting choice of Asian or western dishes. 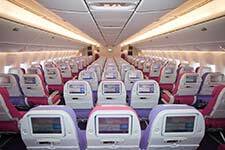 Economy Class : New, wider seats of the latest design have been installed in many of the THAI aircraft, with a new interactive Audio Visual On Demand (AVOD) system offering almost unlimited choice of entertainment and information options. In addition to all the standard items offered for their comfort and refreshment, THAI Economy Class toilets are supplied with fragrant toilet water while eye shades and ear plugs are also available on request. Each passenger is allowed to hand carry one baggage at maximum length 56 cm (22 inches), width 45 cm (18 inches), thickness 25 cm (10 inches). These dimensions include wheels, handles, and side pockets. Infant not occupying a seat is entitled to 10 kg of baggage allowance. Sport equipment can be carried as checked in baggage, if it exceeds the allowance, Excess baggage charge Weight / Piece Concept rule will be applied. Please note that different checked baggage rule, the Piece Concept Baggage is applied for a journey to/from the USA and Canada. The new THAI interactive AVOD system offers literally hundreds of options. With larger screens and touch-control commands, passengers can choose between many of the latest multi-lingual hit movies, classic oldies and popular TV programmes. There are news, travel destination and information channels, music from jazz to classical, Asian to Western, to please every taste, plus interactive games and kids cartoons. Passengers can learn the basics of a new language and even practice meditation with the new AVOD system. Royal First Class passengers are welcomed on board with a glass of Dom Perignon, Bollinger or an appropriate vintage Champagne, and the premium bar service includes aged whiskies, Napoleon brandies, a full range of ports and liqueurs, beers and soft drinks. Royal First Class passengers may take advantage of the exclusive THAI advanced-order service to cater to their individual preferences. Meals are served, restaurant style, in individual courses, always with a tempting choice of main dish. Presentation is also magnificent, with porcelain place settings, fine table linen and crystal glasses. THAI offers a full range of special menus, which should be ordered, in advance, at the same time THAI flight reservations are made and tickets are purchased at the original destination. Check in counter will be open from 2.30 hours until 30 minutes before the scheduled time of departure. Web check in is available. And self-checked in kiosks are available throughout all airports in Thailand. An advance reservation can be made at least 6 hours and a maximum of 11 months prior to departure, with some exception for flights within certain cities. A maximum of nine passengers in the same booking with payment by the same payment card is allowed. Your electronic ticket is not transferable. Refunds will be credited back to the credit card or Visa/MasterCard Debit card that was used for payment, and a refund fee may be applied. However, please be aware that refund processing time of debit card payments may take longer than that of credit cards, as it depends on the process of the debit card issuing bank. Call NusaTrip for further assistance. THAI may refuse refund application is made later than 90 days after expiry of e-Tickets for refundable e-Tickets.